An outstanding SUV comes to the road in the 2016 Mazda CX-9. Performance offerings onboard this three-row, seven-passenger vehicle will get drivers where they want to go with power and might. Ready to experience supreme functionality, performance, and poise? Keep reading, and we’ll explore the Mazda CX-9’s performance offerings in detail. From its horsepower to its towing power, the Mazda CX-9 is set to impress! Under the hood, the Mazda CX-9 is powered by a SKYACTIV®-G 2.5T Dynamic Pressure Turbo DOHC 16-valve 4-cylinder engine with variable valve timing. This mighty engine produces 250 hp when operating on 93 octane premium unleaded fuel and 227 hp on 87 octane regular unleaded gasoline, also delivering 310 lb-ft of torque regardless of fuel use. The innovative turbocharger enables power production the instant the driver hits the accelerator. The Mazda CX-9 engine has also been designed to generate ample torque at lower RPMs—which is where a motorist’s drive time is primarily spent—rather than only in the upper RPM range, as most engines do. The Mazda CX-9’s engine is mated to a SKYACTIV®-Drive six-speed automatic transmission with manual shift and Sport Mode. The powerful engine onboard this versatile SUV enables a towing capacity of up to 3,500 pounds. So, hitch up your toys, your camp trailer, or your cargo trailer—and let the Mazda CX-9 do the rest! In crafting the Mazda CX-9, Mazda’s focus was on the driver and creating outstanding ride quality to make every trip an enjoyable one. From the Mazda CX-9’s body construction and engine design to its transmission and chassis, this SUV has been created using SKYACTIV® TECHNOLOGY to bolster every driving detail while also delivering exceptional fuel economy. The Mazda CX-9 achieves class-leading EPA-estimated fuel economy of up to 25 combined mpg along with an EPA-estimated 28 mpg on the highway. Performance onboard the Mazda CX-9 is further bolstered by Mazda’s available smart predictive i-ACTIV AWD™ All-Wheel-Drive system. This system constantly monitors road conditions, instantly responding to modify power distribution as it is needed when weather and road conditions change, supplying the needed power for optimum traction to keep the wheels securely gripping the road. The services of this innovative system add up to enhanced driver confidence and even greater enjoyment out on the road. 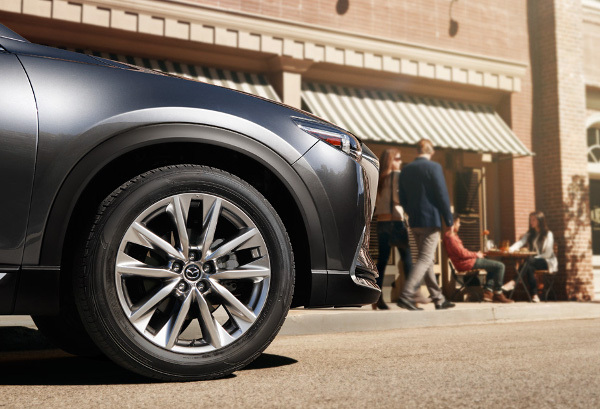 Drivers can experience the 2016 Mazda CX-9 performance for themselves at Biggers Mazda. Stop by our state-of-the-art showroom, or contact us today to learn more about the Mazda CX-9. A friendly, knowledgeable member of our Biggers Mazda team will be glad to walk you through the various options, features, and specifications for the Mazda CX-9. We will then get you behind the wheel so you can experience the performance power of this impressive SUV for yourself out on the open road.